Please enjoy learning with me about how Mason did Sol-fa. This page is an introduction to some of the musical concepts that will be used in the lessons. This is a research work in progress. Things may change as I go, but I want to share what I am learning so others can benefit! Before you begin the lessons, please watch these Videos! This will help you distinguish between the Beat and Rhythm of music. Sol-fa is a system of graduated ear training and voice exercises that are added after 1st grade or Form 1b. Form 1b students would do more musical immersion through Singing games and dances which helps prepare and train their ear for more formal Solfege lessons in Forms 1a (2nd grade) and above. You can use hymns and folk songs in your Sol-fa lessons initially to get started. It’s a fun game to try and figure out the Solfege syllables for the tune of a song you already know. Mr. Curwen, the developer of the Tonic Sol-fa system, said sight singing was about learning Tune (pitch) and Time (rhythm). Sing to the tune – Do,do, Sol, sol, La, La, Sol—, Fa, fa, mi, mi, re, re, do —-, Sol, sol, fa,fa, mi, mi, re—, Sol, Sol, Fa, fa, mi, mi, re—, Do, do, Sol, Sol, La, La, Sol—, Fa,fa, mi, mi, re, re, do—. 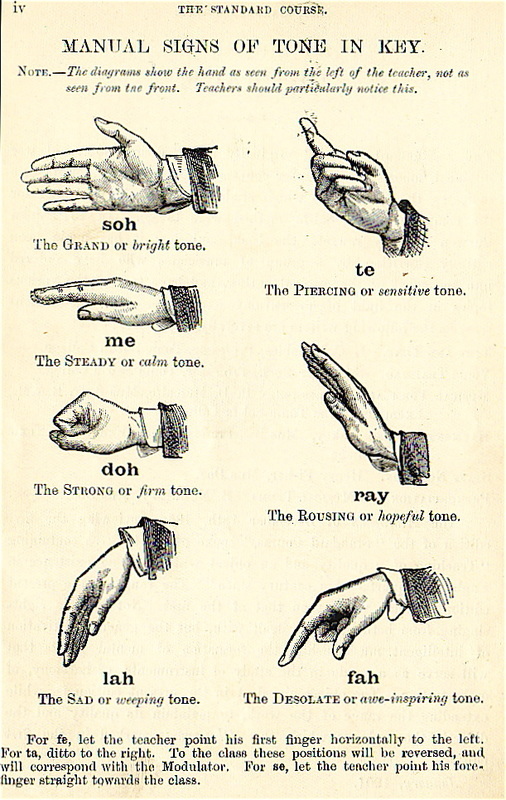 Learn with Hand signs. Play around with the interval Do to Sol as well as the stepping down movement of Sol, fa, mi, re, do.